Provoking dialogue and filtering keywords. We aim to find out what things people are doing and thinking about. Opening the discussion to all. We could find out what are the patterns, and from those patterns which ones are relevant to the Convention Camp audience. Creating a story. We transformed those insights into two short films. Thus sharing a reflection about the Convention Camp at the end of the day. This is the story of a maker. That person that sees a problem and makes a solution. He feels that current platforms limit what he wants to say, so he creates the platform -sharing is caring- to have total control of what he shares, with who, when and how. This start-up shows how different people will benefit from more control over their -sharings-. The story illustrates a trend towards more control of the user over the data and how this will foster even more sharing. This is the story of corporations. They also see the opportunities of sharing. Companies see how by creating spaces for employees to exchange, get to know each other and share insights they will improve their innovation. Many are open to trial those processes, however if this culture is not truly understand, they risk a shallow margin in their innovation culture, and quickly being copied by other companies. We can see how some initiatives have understand well the boundaries of sharing and provide you (the user) with certain aspects of security so that you know that you can control it: AirBnB give you insurance so that you know your home is safe; betahaus makes sure you always have a place to work; google documents allow you to share your document with those who you want to work, or make it public. Those initiatives, inspired by our needs, learned how they can foster sharing by giving the user control of certain parameters. Talks and presentations at conferences are not any more sharing something new. Most projects and presentations can be find online long before the conferences happen. Instead conferences are a great place where people go to meet other people. And is through the discussions that arise between them, that new ideas and concepts emerge. People in beta (session) / Convention Camp 2012 from Nina gleich on Vimeo. Release the video before. To have the biggest impact people have to know this video will be produced, and the video have to be shown in time for people to discuss it. The opportunity for people to see how the process work live. We added a more collaborative, open and reflective dimension. Our process was a real experience of what it means to be beta, something that most people might not see everyday and might have provoked them to think different. You can’t get creative insights sitting behind an office desk. Everything is more or less predictable and contradictory things can be left outside. Out in the world, it’s more chaotic. You have to deal with unexpected findings, with uncertainty, and with irrational people who say things you don’t want to hear. But that is where you find insights. We want to know How will we un-share the world in the future? We want to learn about the limits of openness, connectedness and sharing. And imagine scenarios which narrate our insights into a story. This story is a spontaneous reflextion of what happened at the convention camp, and we will share it at the end of the day with all. 15:00 – 16:30; Envisioning scenarios, Session*to translate ideas into tangible stories. 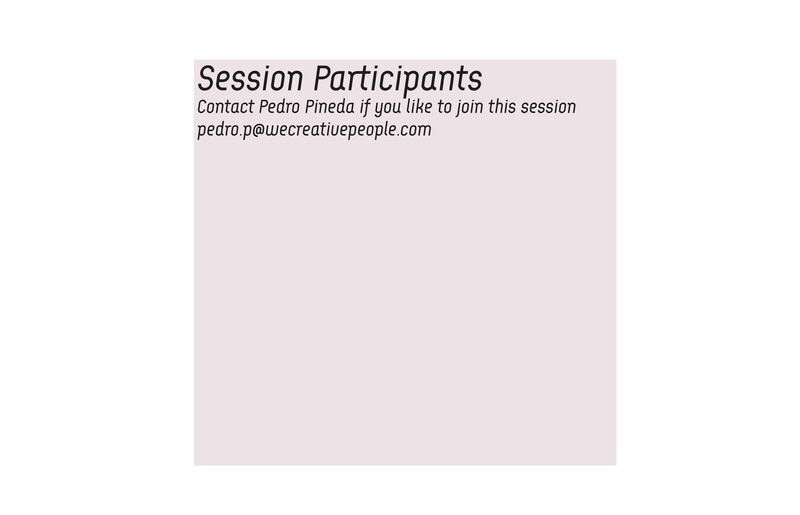 The session is facilitated by Pedro Pineda. It is designed to visualize an spontaneous reflection to the convention camp and what is happening at this very moment. The session is inspired by betahaus which is a co-working space. Here things are not predictable, some things are very contradictory and irrational people try to change the world. The session will be kickstarted by Anne, Alessandro, Rick, Maximilian, and Ricardo. All from different backgrounds, have never work together before, do not even have an action plan, but are all co-workers willing to get out of their comfort zone. Ric Ferrer is founder and chairman of the advisory board at 533 AG, a company he started recently in order to support and fund projects related to “the future of work”. He is co-founder of the coworking space EDELSTALL (http://edelstall.de) and the cloud storage start-up doctape (http://doctape.com) where he is currently working full-time as Chief Creative Officer. He uses his extensive experience in management, design and programming to advise and help in the conceptual design on all projects he is involved with. Having been raised in Venezuela, gone to school in the U.S.A. and spent big part of his adult life in Germany, his multi-cultural background serves him well in order to predict the needs of an emerging digital generation of nomadic professionals. Max Dörner is a Future managment researcher and Business Anthropologist engaged in a multitude of fields including future analysis and foresight, design thinking as well as business culture and innovation management. He uses integrative, interdisciplinary techniques to determine complex contextual problems, and solve them. Working as a Marketing Executive, Analyst and Consultant in different industry fields such as marketing, design and innovation he has an array of viewpoints to draw upon and contribute. Born in Germany, raised in New Zealand, he studied Anthropology and Ethics, continued on to do postgrad in Development Studies in NZ and Berkeley,California. He then returned to Berlin to complete his masters in future studies. Rick Scavetta was born in Toronto, Canada and completed his Ph.D. in Germany at the Max Planck Institute for Evolutionary Biology. In addition to Canada and Germany, Rick has also conducted parts of his training in Singapore and Iran. Throughout his academic career, Rick has consistently been engaged in student leadership, actively promoting the personal and professional development of his peers. Thus, it was a natural transition for Rick to go from the laboratory to a research support role as a co-founder of Science Craft. Science Craft is dedicated to offering outstanding transferable skills training to graduate students in the life sciences. Since it’s foundation in February 2012, Science Craft has attracted growing interest from many top-level research institutes in Germany and will begin offering international workshops next year. Rick combines his infectious enthusiasm for science and its communication with a unique ability to inspire life scientists in their career development. Anne is a 2006 graduate from the KaosPilots in Denmark. From 2006-2009 she worked as creative lead and corporate social responsibility consultant for the Copenhagen-based brand strategy company, Stoic, where she amongst others developed and implemented Samsung Electronics award-winning CSR strategy for Scandinavia. Since 2006, Anne has also managed her own humanitarian project, We Have a Dream, which organizes global workshops to empower youth through drawings and discussions about their dreams for the future. The project has reached over 3000 children in 22 countries. Anne exhibits the drawings in public and political places to increase awareness and raise funds for children growing up in disadvantaged areas. Alessandro Contini is a designer and a tech savvy. He works with sounds, images and coding. After graduating in Computer Science with Music Technology in Milan he started collaborations with international companies such as Interaction Design Lab, Nokia, Eyebeam Art + Technology center for the Arts, and taught classes at Milan Polytechnic University, NABA and Domus Academy (Laureate International Universities). Currently he’s a freelance creative technologist, interactive artist and regular hackathon-goer! Born in the Canary Islands (1985) , Studied Design & Technology in London and now is living in Berlin where he is developing different ways to apply collective & creative problem solving to challenges that affect us as individuals or as society. He sees design as a tool to create and facilitate experiences. It “is not enought to look at the isolated product or service but at the whole experience that we want to create” His work is released open source for all to copy, build upon and distributed. Enable Berlin will be taking part in the product development of Santim bidelet, a project dedicating to research whether hygiene techniques used in some countries – washing oneself with water instead of using toilet paper – can be an environmentally sound, culturally acceptable and practically viable option. The session will be taking place tonight with a group of participants selected by Santim, but you are very welcome to join if this is in your interest. Contact info@enableberlin.com for more information. CeBIT is Europe’s biggest consumer technology fair. Over 5 days and across 26 halls, big-name businesses, middle players and startup companies showcase their products, drawing crowds in their hundreds of thousands. The annual expo, held in the Hannover Fair Grounds, usually attracts a certain attendee: buyers, distributors and company representatives, suited and corporate, come together to compete against one another, showcasing products that have been created in firms with closed-house policies. In essence, it represents the antithesis of the coworking movement, which is based on principles of collaboration, co-creation, and openness. This is partly the reason why, this year, betahaus was invited to CeBIT to introduce the concept of working collaboratively to the corporate world. The space that was created was in every way different to the other stands populating the expo, and came into being with the help of dozens of individuals from different professional backgrounds. 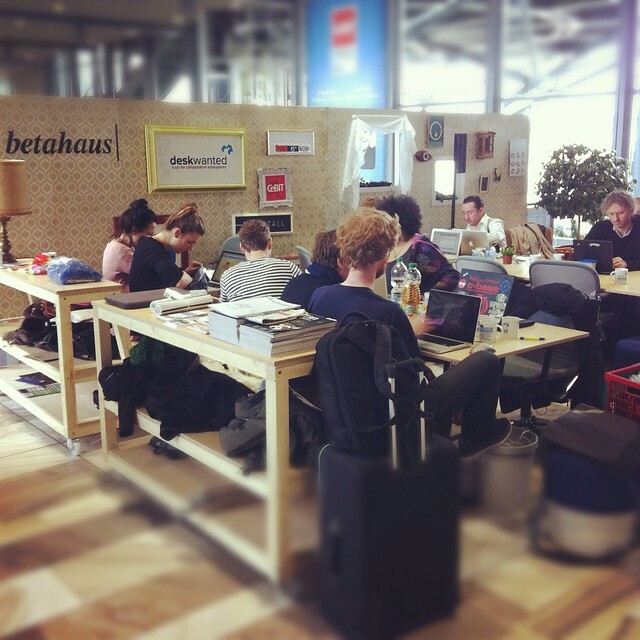 Together, we created an environment which reflected the betahaus philosophy. JAY – core group, project coordinator/catalyst/facilitator: We went to CeBIT with the objective to bring our culture – the Spirit of Betahaus and Coworking communities in general – into the CeBit Global Conference. For those familiar with the conference this is no small task as the environment is somewhat formal, austere, tightly scheduled, organized and controlled. Coworking, by contrast, is distinctly informal, chaotic, and evolving. Ironically, in order to create an open space of engagement, we had to create our own walls, and build an environment where our participants felt at home. 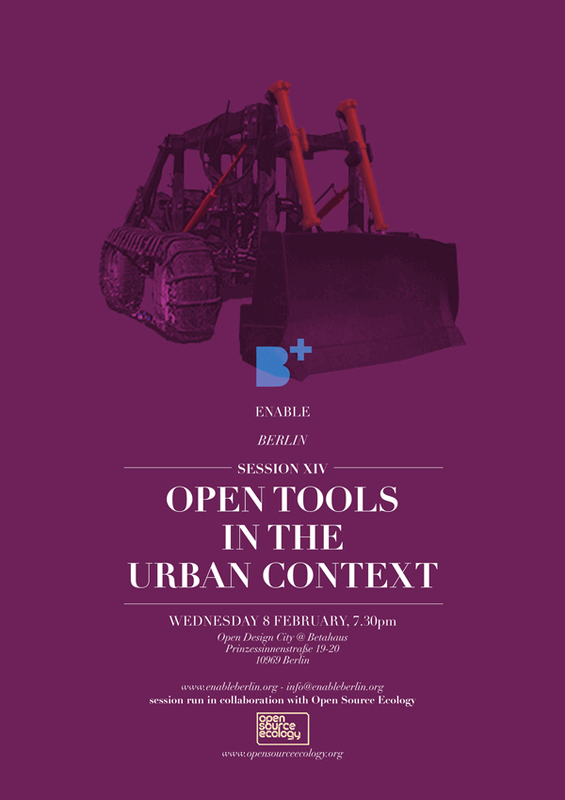 A collaboration between Enable Berlin and Open Source Ecology (Kansas City), Enable Session XIV: OPEN TOOLS IN THE URBAN CONTEXT is scheduled for Wednesday, February 8, and will be focusing on the combined topics of urban infrastructures and DIY. This will be the perfect occasion to understand how citizens and users interact with space, what are the tools available for them to do so, and how could they be perfected. Open Source Ecology is a network of farmers and engineers running a factory farm in Kansas City. They have set out to develop a basic set of tools with which they can autonomously build an entire infrastructure, and have been disclosing their process as an open-source documentation, so that everybody else in the world can learn from them, and improve on the existing tools. Nikolay Georgiev works as part of this network, and for the occasion of his coming to Berlin, Enable will be running a session dedicated to learning about his experiences and developing new solutions for the urban context. As during every session, participants from various backgrounds will be invited to analyse and discuss their very needs, determine which are the key problems they encounter, imagine and prototype new solutions. If you wish to join the event, please let us know by email at: info@enableberlin.org or by signing up on the facebook event. As we are helplessly witnessing what may be the first steps towards the decline of our financial system, and along with it a complex set of morals and norms we hardly ever think – or dare – to question, next Enable Session will be doing just that. Participants to the next Enable Session will be challenged to see further than that, and to explore what other alternatives to money might be viable in the near future. We would therefore like to invite participants to attend Enable Session XIII – New Deals, Future Money on December 1st, 7.30pm at Open-Design City/ Betahaus Berlin, Prinzessinnenstr. 19-20, U8 Moritzplat. If you are coming, inform us vial email info@enableberlin.org. We were recently invited to present Enable Berlin at Newcastle University during last Connected Communities Symposium. This was an extremely interesting event, gathering creative minds from around the world to present and discuss their initiatives. The lectures were streamed live and ours can still be seen on ustream. For better quality we suggest you watch the first 16min and when the video starts, digress to our online version in HD. We’d like to thank everyone involved in organising this wonderful event. If you have a challenge where collective thinking & participatory design could help, let us know! We are happy to design new sessions with you.